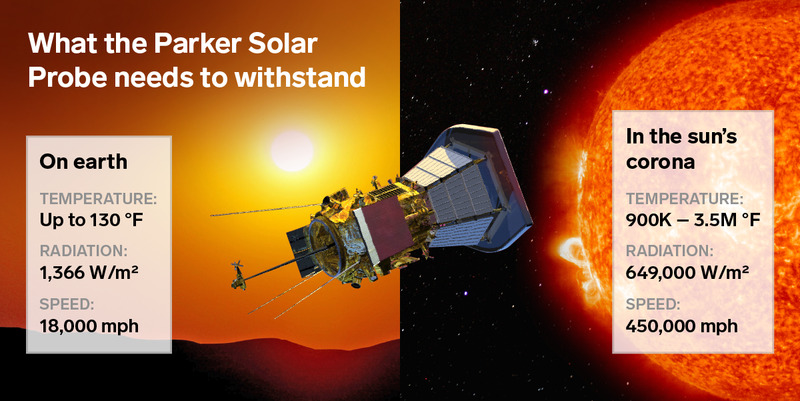 NASA/Johns Hopkins APL/Steve GribbenAn artist’s concept of NASA’s $AU2.03-billion Parker Solar Probe mission passing by the sun. 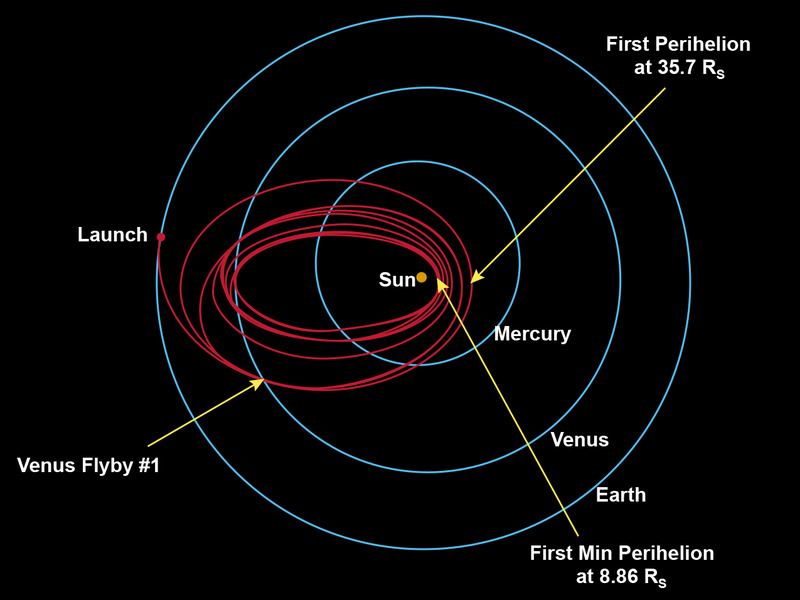 NASA‘s Parker Solar Probe is scheduled to launch Saturday, August 11 around 2:33 p.m. AEST. To “touch” the sun and study its weather, the $AU2.03-billion mission must survive hellish conditions. Temperatures will reach a searing 1,371 degrees C when the spacecraft zooms through the star’s atmosphere at 692,000km/h. But that is precisely what NASA plans to do – 24 times or more – with its car-size Parker Solar Probe (PSP). The goal of the $AU2.03-billion mission is to edge within 4 million miles of the sun, which is close enough to study the star’s mysterious atmosphere, solar wind, and other properties. The spacecraft is slated to launch from the Florida coast on Saturday at 3:33 a.m. EDT, should weather cooperate, though NASA has through August 23 to fire off its probe. PSP will reach the sun a few months after launch. 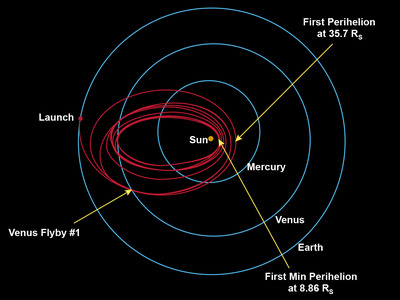 Johns Hopkins University Applied Physics LaboratoryThe orbital path that NASA’s Parker Solar Probe will have to fly to ‘touch’ the sun. NASA chose the rocket because it’s surprisingly hard to get to the sun, which is 93 million miles away. Earth orbits the sun at a speed of 107,000km/h, and so does anything launched off of the planet. To fall toward the sun, PSP will have to slow down by 85,000km/h, NASA said in a video about its mission. The consequence of this orbital dance is that PSP will fall toward the sun faster and faster after each pass. On its first orbit of the sun in November 2018, the probe will be some 15.4 million miles from the sun. About 21 orbits later, in December 2024, it will sneak within 4 million miles of the sun, travelling at a speed of nearly 692,000km/h relative to the star. Achieving such a velocity would make PSP the fastest a human object in space. It’s nearly 120 miles per second – fast enough to fly from New York to Tokyo in less than a minute – and 3.3 times as fast as NASA’s Juno spacecraft, which zips past Jupiter at speeds of 209,000km/h. 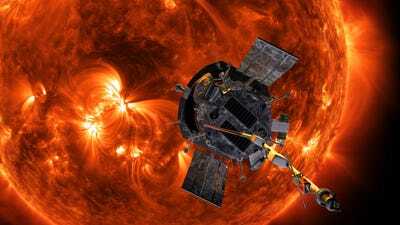 David McNew/Getty Images; NASA; JHUAPL; Jenny Cheng/Business InsiderNASA’s Parker Solar Probe must withstand blistering temperatures and incredible speeds near the sun. During its journey, PSP must withstand sunlight 3,000 times more powerful than occurs at Earth. Outside the spacecraft, in the outer fringes of the sun’s corona or atmosphere, temperatures may reach 1,371 degrees C – hot enough to liquify steel. 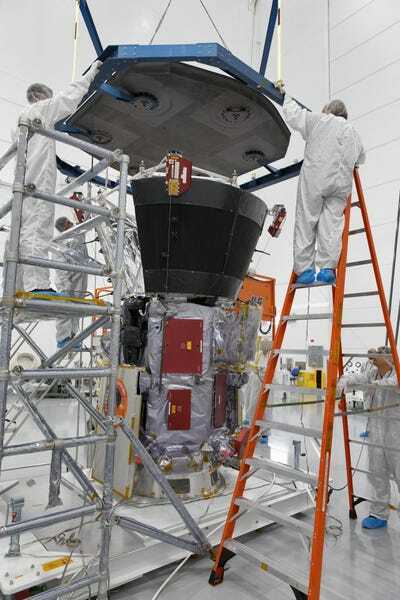 NASAThe carbon-foam-and-composite heat shield of NASA’s Parker Solar Probe is craned into place atop the spacecraft on June 27, 2018. Made of 4.5 inches of carbon foam sandwiched between two sheets of carbon composites, the eight-feet-wide shield will absorb and deflect solar energy that might otherwise fry the probe. 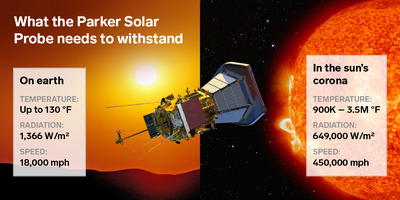 A water cooling system will also help prevent the spacecraft’s solar panels from roasting and keep the spacecraft a cosy 85 deg F.
PSP’s mission is to crack two 60-year-old mysteries: why the sun has a solar wind at all, and how the corona – the star’s outer atmosphere – can heat up to millions of degrees. Both factors are key to understanding what leads to potentially devastating solar storms. You can watch the Parker Solar Probe launch toward the sun on Saturday, August 11, around 3 a.m. EDT via NASA TV. The probe’s mission will end many years from now, after it runs out of the propellant it needs to keep its heat shield pointed at the sun. When that happens, the star’s blistering heat will burn up “90% of the spacecraft,” science writer Shannon Stirone said on Twitter – but not the heat shield itself.